Standing at the kitchen sink earlier this week, staring out the window, I was reminded of a huge A-HA I had several months ago. The desert is full of hundreds of varieties of cacti. One of my favorites is the ocotillo. The blooms are vibrant red and top the end of each spine with glee. 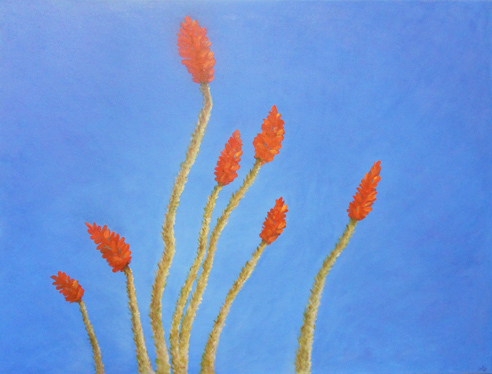 I painted this ocotillo last fall from a photo taken by a friend. I love the sense of space, the blue desert sky and the blooms reaching towards the sun. Back to staring out the kitchen window, I was enjoying a daydream when my eyes focused in on the ocotillo that is directly in front of the window. Recognition occurred like a slap in the face. It was the exact same image I had painted months prior to my move. Walking over to the back window, I was again struck by the similarity of this view with the painting below from the same series. Most everywhere you look in Palm Springs, you get a view of the mountain but with buildings. When I was taking photographs, I was looking for an unobstructed view. Obviously, with painting, you can just edit out, which I did. But up where I am NOW, there are unobstructed views. And this is basically what I see out my window. I do a lot of reading about goals, desires and having the life you want. There is a reason people do vision boards. 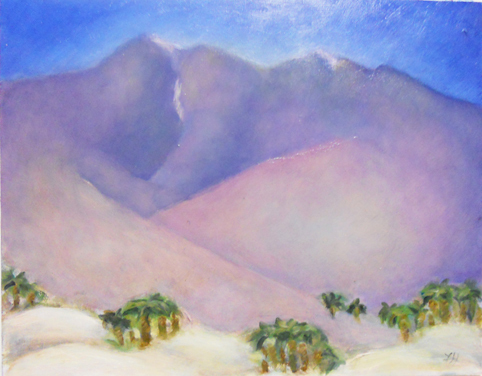 When I returned from France, my desire for wide open space, big desert views and beauty was primary. I kept that in the forefront of my mind. 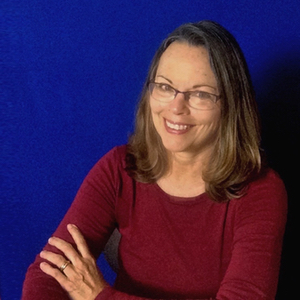 When I found myself in this new space, completely surprised by the unexpected opportunity, I had so much gratitude for the unknown forces that conspired to get me here. It took some time before I made the connection but on some level, it feels like I painted my desire, my next step, into being. For me, this is the ultimate in life: using the creative process to live more fully into who you really are. In my search for a theme, I’ve been torn between very expressive larger canvases and more precise much smaller panels. 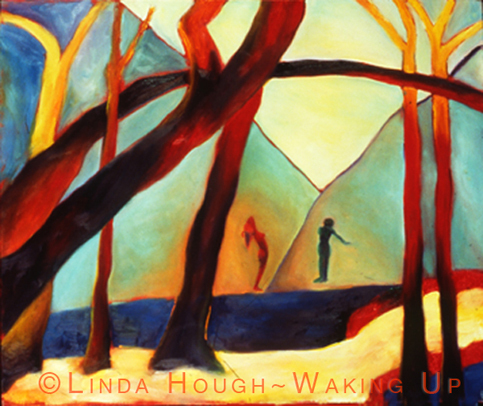 So there is a feeling of really wanting to cut loose and go all abstract. And then the feeling of wanting a sense of place, a feeling of comfort and home and lovingly depicting that. As much as I’d wanted to just let whatever come out be okay, ALL my beliefs about ART, all that I learned in school and traditional gallery consensus came flying up in my face. Not to mention all my beliefs about artists and success. Why even bother? I asked myself. I’d be do much better putting my time and attention into something. More. Worth. While. This was pretty much why I stopped painting before. These taunts and terrorizing thoughts relentlessly spinning around in my head creating the intended result: I don’t paint. My subconscious has again done a fantastic job and I stay safe for another day. Except I’m not really safe. When you are not using your gifts and talents, not contributing to the world in general, you are not really in a very safe space. It’s more like a self-imposed prison. Which is kinda how I feel right now. So I decided to switch it up a bit and have a little fun. In the July issue of Palm Springs Life Magazine, there is an article on Charles Phoenix or, as he is called, Retro Daddy . He is obsessed with midcentury Americana. In the article, there were several 1950’s photos of Palm Springs. The feeling was nostalgic and a great big dose of FUN! Suddenly, the spark was ignited. 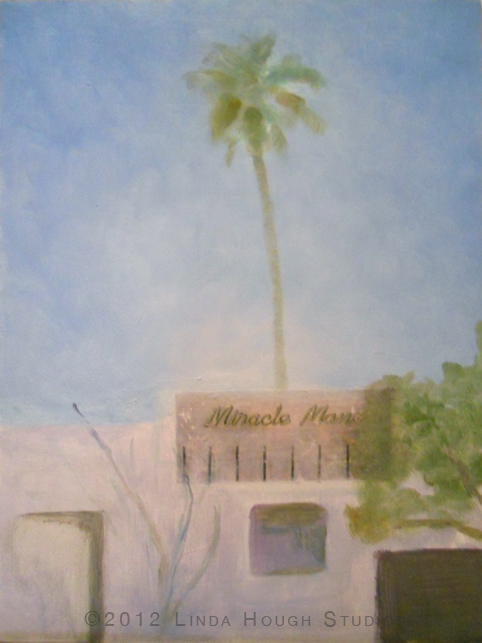 I’d been wanting to do these small paintings of old Palm Springs since I’d returned. They elicit such a warm comfy feeling for me. Riding around town on our bikes, up and down the streets with houses that have come to be known as prime examples of midcentury Modern. 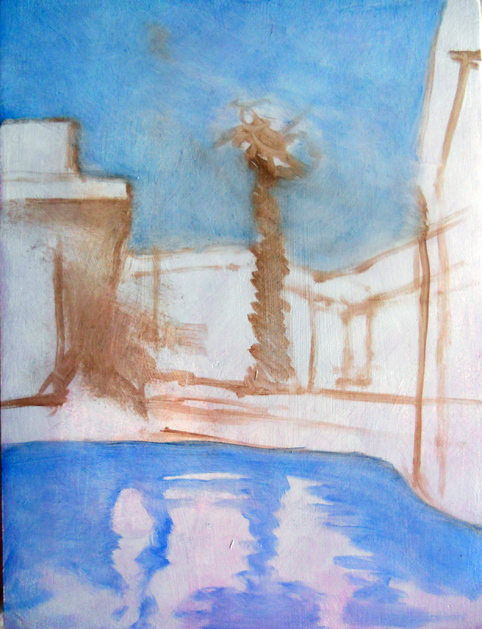 So I began this underpainting. Just roughing in the big shapes. 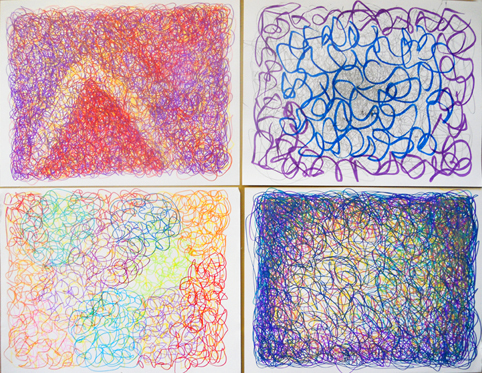 Drawing lightly and loosely. Not too concerned with precision, just with general composition, light and color. It already feels good. Stay tuned till next week to see how it evolves.